Usually I talk about ways to improve your English pronunciation, but today I want to address a writing issue and a quick way to solve it. Many non-native English speakers working in the U.S. have told me that they are often afraid to send emails. They know that their writing is not perfect, but as hard as they try, they are unable to see their own grammar mistakes. They send their message, only to hear negative comments from their supervisor and coworkers about their English. How frustrating and embarrassing! ​Sending emails with errors really sends the wrong message. People assume you don’t speak English well, that you’re not competent in your work, that you’re not very educated or that you’re sloppy. This is not the impression you want to make. And it is even worse if you are looking for work. You certainly don’t want to have any grammar errors in your resume and cover letters. 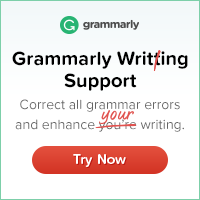 I want to share with you a great free resource that can solve your writing problem: Grammarly. You just download the extension in your Chrome browser and it will suggest corrections to your grammar, spelling and punctuation in everything you write. The free edition will catch most of your basic mistakes. The premium version will catch all your mistakes. It’s like you’re Harry Potter and you have a magic wand you can just wave and have perfect writing. Writing is not an easy skill, especially in a second language. Whether you’re a native English speaker or English is your second, third or tenth language, you need this. Imagine never being afraid to send an email again. Correct all those embarrassing mistakes before anyone sees them. This awesome tool works everywhere you write. It corrects your emails, Facebook posts, Twitter messages, resumes, job applications, essays, articles, blog posts, anything you write. Accent Coach Nicole helps non-native English speakers speak more clearly & understandably, so they can reach their full potential & achieve all their goals & dreams. Sing your way to English speaking success! Use music to help you improve your English. Copyright 2017 NW SOAR. All Rights Reserved.